"Joss Whedon, Steven Moffat and George R.R. Martin walk into a bar and everyone you've ever loved dies." Here's the problem, though: George R. R. Martin and Joss Whedon are, of course, infamous for killing off the characters that they know are almost universally beloved by fans for precisely the reason that they are beloved and Martin and Whedon know it'll have huge emotional impact. They pick the harmless bunny of the group and then give them some brutal offing — Tara on Buffy, Wash on Serenity, Ned Stark in A Game of Thrones being an easy handful of examples. But who has Steven Moffat actually killed off? The two-parter that he wrote during the Christopher Eccleston/Russell T. Davies era literally ends with the Doctor blissfully proclaiming that "Just this once — everybody lives!" In fact, a woman who lost her leg years earlier is restored to bipedalism by space magic. It was an amazing, heartwarming scene specifically because of the first part of that sentence — "just this once." But apart from that two-part episode, the Davies era was plenty bloody. While Doctor Who is ostensibly a kid's show, Davies made it clear that plenty of innocent people have been killed — often en masse — during especially high-stakes alien attacks despite the Doctor's heroic intervention. And let's not forget that Davies kicks off the entire reboot of the show by announcing that (nearly) all of the Time Lords and (nearly) all of the Daleks were wiped out by our genocidal and deeply guilt-ridden hero. That was a hell of a way to re-introduce a popular kid's show back to the airwaves, but it was perfect. It made the Doctor a new and mysterious character for people who'd never seen the show before, and it changed the way older fans looked at him. You couldn't just continue down the same old lines and pick things up after all that time without some real change and expect it to work. And the change Davies employed worked beautifully. Until last week, of course — but we'll touch on that later. So let's get back to the central question: who has Steven Moffat killed? Well, on the last season of Sherlock, fans were reeling when Moffat had the show's eponymous lead jump to his death, although with the promise that we'd find out how he faked it when the show resumed. So that doesn't count. Well, what about Moffat's next Who episode in Series 2, The Girl in the Fireplace? Reinette (Madame de Pompadour) dies, but she dies of old age because — and don't even get me started on how annoying this concept is — the Doctor ditches her to go back in the fireplace one last time, apparently forgetting that it always results in a huge time jump. So that doesn't quite count, as Moffat was fulfilling history. Next up is Blink, Moffat's first chilling installment of the once brilliant and now sadly tiresome Weeping Angels. Who dies? Well, the nice security guard that Sally chats with dies of old age after being displaced in time. The same fate is afforded to Sally's best friend, but she does manage to write a letter letting us know everything's pretty much cool, because who wouldn't want to be taken away from their family and friends to churn butter for 60 years? But other than that? Nobody. A theme seems to be emerging. The Silence in the Library and Forest of the Dead? Well, Moffat does kill off River Song and her whole crew, but then has their souls uploaded onto the library server so that they'll never "truly" die. Again, it's an extremely softened death, similar to the "old age/time displacement," in that it's sad but any real cause for grief has been removed. Then Moffat, of course, took over the show as show runner. And once again, people just seem to keep… not dying. Part of the problem is that Moffat's a big fan of the Giant Reset Button — so much so that he literally wrote in a Giant Reset Button into the episode Journey to the Center of the TARDIS. One step above the "It was all a dream" plot, the Giant Reset Button absolves the characters and the writers of any repercussions and they can carry on as they were, even though we, the audience, saw a "major event" that is evidently no longer relevant. You can have your fun and adventure, but you need not learn or grow or change from it. Other notable not-deaths include any time Rory "died" in the series, the almost-people clones, the Doctor himself during the impossibly confusing 6th series finale, Vincent Van Gogh and, finally, The Ponds who were killed off exactly the way Sally's security guard almost-lover in Blink was — by being displaced in time in such a way that the Doctor, for hand-wavey reasons, couldn't just go pick them back up again and they seem to do just fine living in the past because they have each other, I guess. The mass genocide that the Doctor committed — all the people he killed and all of the times he wrestled with that decision and was forced to come to the conclusion that it was for the best — simply never happened now. All of the amazing episodes in which the Doctor, overcome with grief, spoke about the tragic necessity of his decision are rendered meaningless by this newly-invented War Doctor who allegedly "didn't count" until now. Now he counts. Maybe. Because of the magic of love and Bad Wolf. Now of course you can argue that the show plays with time constantly, and that it's possible that this is a new time stream in which it didn't happen, and that's all well and good. But the fact of the matter is that from this point on, the Doctor is no longer complicated by this event. 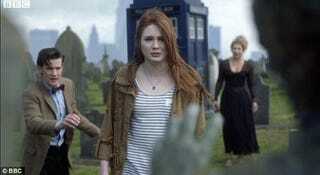 Moffat, who has never had the best track record with character development as it is, has actively written a plot which removes an enormous amount of change and progression from the show's lead character. But more importantly than that, when you have no death, when nothing truly has weight or scale, when decisions don't stick and nobody feels the consequences… it's hard to care about anything. The stakes on the show feel so low at this point that a once addictive program is unengaging, dull and hollow. Even the 50th special had no real gravitas because we were basically watching a plot be un-done, rather than made. We were watching a character be un-banished, rather than created. For a celebration of 50 years of a television show, it felt awfully like a celebration of a writer who's only been running it for 4 years. And, perhaps most irritatingly for a Davies fan, the complete erasure of everything that was developed during that previous era. I don't think it's an insult against Davies, though — Moffat does it constantly to himself. Amelia Pond grows up without parents because they were erased by a crack in space and time. When they are restored to her by virtue of yet another giant re-set button, we never see them again. Amy rarely talks about them. You cannot have a character whose parents were taken from her at a young age, who then gets them back — and remembers that she had lost them in the first place — and not see a perceivable change in said character. Similarly, you cannot rob that character of her baby, remove her ability to have children, and have the biggest consequence be that she becomes a model who's moody with her husband for his own good. Or take the latest companion: Clara cannot live and die hundreds of times for her good buddy the Doctor (who she'd known for, what, a month?) and then basically brush it off like it's nothing. We can talk for days about Moffat's other problems as a writer — the sexism, the homophobia — and those are all valid complaints, but what will always be my biggest gripe is his fear of consequences. When you cannot deal properly with grief or loss or change, you cannot write believable characters or interesting stories. And as long as this show lacks believable, real, characters and engaging stories, it will continue to suffer. So please, for the good of Doctor Who, shed a little blood and actually deal with it. Revel in consequences. Let your human characters behave like humans. In short: restore the heart to a dying show. Another Doctor Who post? I know, I know. But I've been wanting to get this one off my chest for a few days now. I couldn't quite articulate for a while exactly what made me so mad by the end of last week's special, and I think it's just that it represents everything I hate about Moffat as a writer: sexist, lazy, afraid of consequences.